The worst thing ethically and politically is to let [Eurocentric] separatism simply go on, without understanding the opposite of separatism, which is connectedness…. What I am interested in is how all these things work together. That seems to me to be the great task – to connect them all together – to understand wholes rather than bits of wholes…. 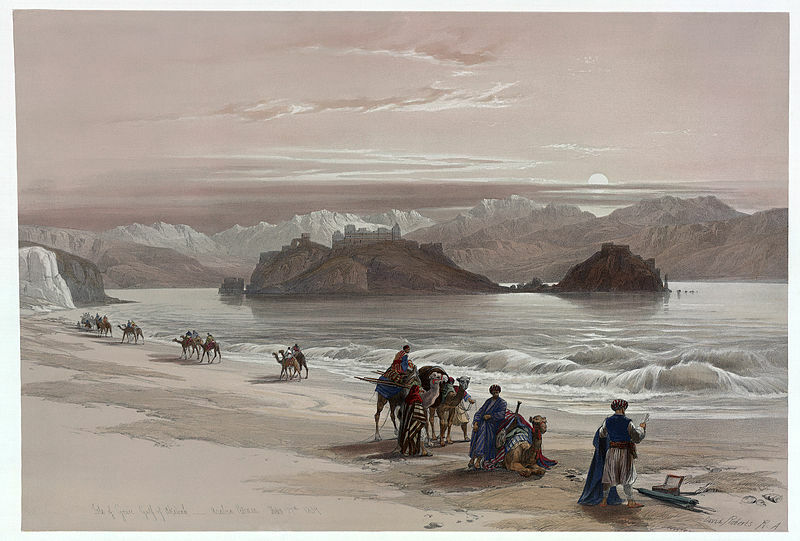 In a wonderful phrase, Disraeli asks, ‘Arabs, what are they?” and answers: “they’re just Jews on horseback.’ So underlying this separation is also an amalgamation of some kind.” Edward Said 2004. Under the reign of Eurocentrism, the Western mind imagines that even if Islam came up with all manner of new ideas and technologies – ideas in engineering, art, mathematics and at a big push, science – even if this were all true we know that Islam is antithetical to capitalism. Wasting time praying 5 times a day makes disciplined capitalist activity a near-impossibility. And in any case, all this ‘irrational’ religious behaviour is the counterpoint to the cold hard rationality of capitalism. Indeed we know that Islam rejects usury and so the possibility of banking and making profits from capitalist activity is ruled out tout court. Given all this, even if the Muslims came up with all manner of ideas in the aforementioned areas, Europe and the West could have gained nothing from Islam in terms of developing capitalism. So what have the Muslims ever done in terms of enabling capitalism in general as well as contributing to the development of early capitalism in Europe? Obviously nothing, we are told in the West, which is precisely why in Western histories of the rise of capitalism it makes perfect and logical sense for us to focus solely on what went on in Europe as the Europeans pioneered capitalism and the institutions upon which it rests without any help from the non-Western world. Notable here is that our standard histories of the long rise of capitalism in Europe sometimes begin with the Italian commercial and financial revolution after about 1000; so it is to this that I shall now focus upon. 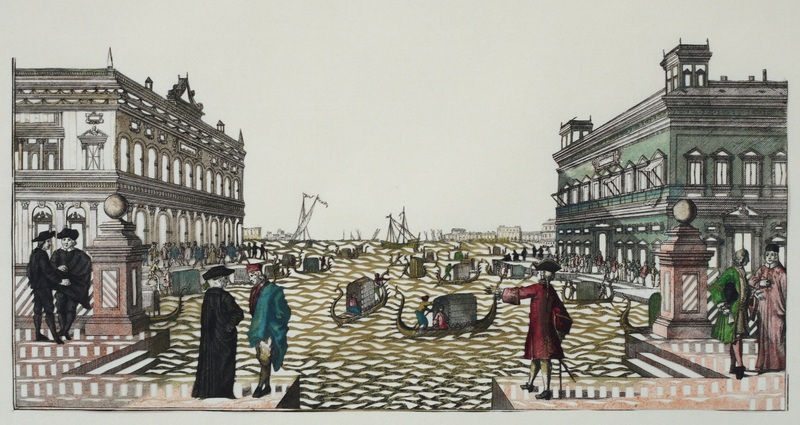 The notion that it was Venice that we should turn to rather than the Islamic Middle east and North Africa is problematic for at least four main reasons, all of which reveal that European commerce post-dated that of Islam and that without Islam there might never have been a Venetian trading hub at the centre of European commerce. First, Islam had a high propensity for commercial trade and capitalistic activity. I can think of no better illustration of this than reminding ourselves that The Prophet Mohammed had been a commenda (qirād or mudaraba) trader. Moreover, in his twenties he married a rich Qurayshi woman (the Quraysh had grown rich from the caravan trade as well as banking). Interestingly ‘the Meccans – the tribe of Quaraysh – caused their capital to fructify through trade and loans at interest in a way that Weber would call rational…. The merchants of the Muslim Empire conformed perfectly to Weber’s criteria for capitalist activity. They seized every and any opportunity for profit and calculated their outlays, their encashments and their profits in money terms’ (Rodinson 1978: 14). Second, many linkages between Islam and capitalism can be found in the Qu’rān. 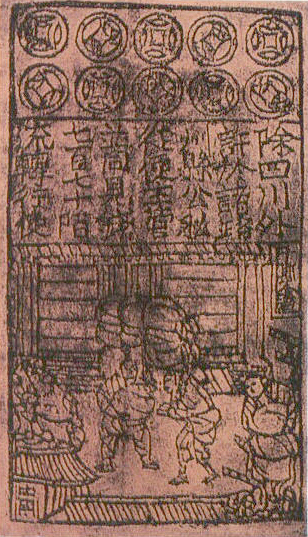 Thus the Qu’rān, ‘[d]oes not merely say that one must not forget one’s portion of the world, it also says that it is proper to combine the practice of religion and material life, carrying on trade even during pilgrimages and goes so far as to maintain commercial profit under the name of “God’s Bounty”’ (Rodinson 1978: 16–17). If thou profit by doing what is permitted, thy deed is a djihād…. And if thou invest it for thy family and kindred, this will be a Sadaqa [that is, a pious work of charity]; and truly, a dhiram [drachma, silver coin] lawfully gained from trade is worth more than ten dhirams gained in any other way (cited in Rodinson 1978: 29). And The Prophet Mohammed’s saying that ‘Poverty is almost like an apostasy’, implies that the true servant of God should be affluent or at least economically independent. The booths of the money-changers in the great mosque of the camp-town Kufa illustrate the fact that there was no necessary conflict between business and religion in Islam. (Goitein 1968: 228–9). It is also significant to note that the Qu’rān stipulates the importance of investment. And while many in the West associate the Sharīa (the Islamic sacred law) with despotism and economic backwardness, it was in fact created as a means to prevent the abuse of the rulers’ or caliphs’ power and moreover, it set out clear provisions for contract law. Not surprisingly there was a rational reason why the Islamic merchants were strong supporters of the Sharīa. The density of commercial relations within the Muslim world constituted a sort of world market… of unprecedented dimensions. The development of exchange had made possible regional specialisation in industry and agriculture…. Not only did the Muslim world know a capitalistic sector, but this sector was apparently the most extensive and highly developed in history before the [modern period] (Rodinson 1978: 56). This naturally flows into the fourth counterpoint to the Eurocentric dismissal of Islam: that ultimately Islam’s comparative advantage lay in its considerable ‘extensive’ power. That is, Islam was able to conquer horizontal space, realised most fully in its ability to spread and diffuse across large parts of the globe, of which the expansion of commercial capitalism was but a symptom. 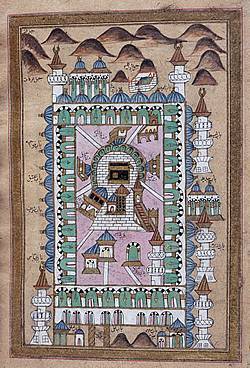 The centre of Islam, Mecca, was not some kind of irrational pilgrimage terminus, but it was one of the centres of the Afro-Eurasian trading network. Islam’s power spread rapidly after the seventh century so that the Mediterranean became in effect a Muslim Lake, and ‘Western Europe’ a tiny promontory lying on the far western tip of a vast Afro-Asian economy. Islam spread not only westwards into Christendom – most especially into Spain (al-Andalus) between 711 and 1492 as well as Sicily in 902 – but also eastwards right across to India, Southeast Asia and China, as well as southwards into Africa particularly through commercial influence. 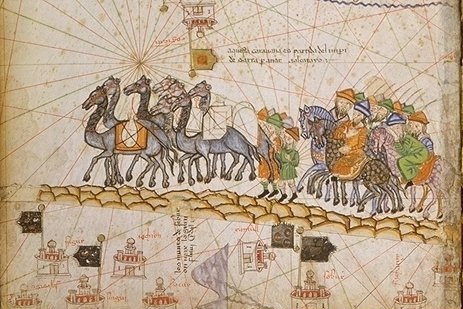 Its economic reach was so extraordinary that by the ninth century there was one long, continuous line of transcontinental trade pioneered by Islamic merchants, reaching from China to the Mediterranean. The key point here is that between about 600 and 1492 what we witness is what I call Afro-Eurasian regionalization, which was subsequently upgraded into the world’s first global economy after 1492. And throughout this period, the Muslims were the principal architects of the Afro-Eurasian trans-continental economy. 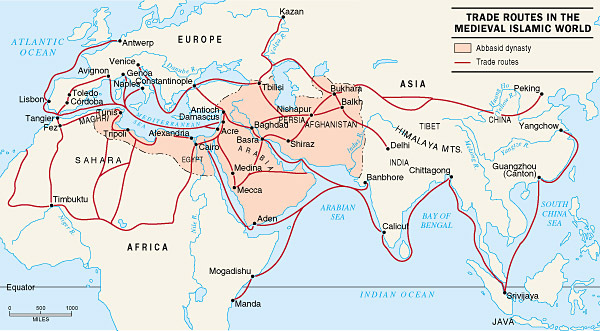 The Middle Eastern Ummayads (661–750 ce), Abbasids (750–1258 ce) and North African Fatimids (909–1171 ce) were especially important, serving to unite various arteries of long-distance trade known in antiquity between the Indian Ocean and the Mediterranean. These included the Red Sea and Persian Gulf routes. 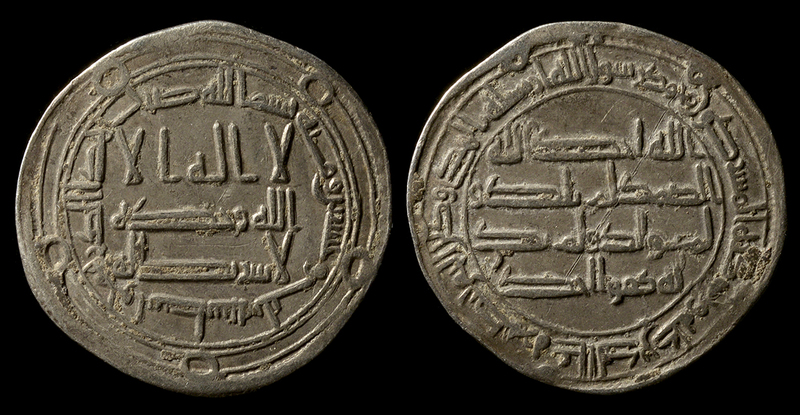 The Abbasid capital, Baghdad, was linked to the Persian Gulf route, which in turn fanned out through the Indian Ocean and beyond into the South China Sea as well as the East China Sea. This route has been termed the Middle Route by Janet Abu-Lughod. Al-Ya’qūbi (c. 875), described Baghdad as the ‘water-front to the world’, while al-Mansūr proclaimed that ‘there is no obstacle to us and China; everything on the sea can come to us on it’. And there were numerous other Islamic ports that were important, especially Sīrāf on the Persian Gulf (on the coast of Iran south of Shīrāz), which was the major terminus for goods from China and Southeast Asia. The Red Sea route (guarded over by Egypt) was also of special importance. The people of Tabriz live by trade and industry…. 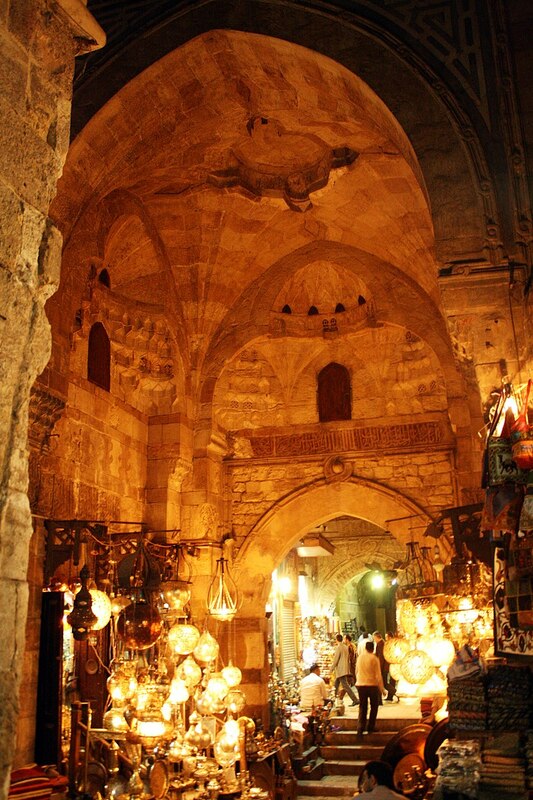 The city is so favorably situated that it is a market for merchandise from India and Baghdad, from Mosul and Hormuz, and from many other places; and many Latin merchants come here to buy the merchandise imported from foreign lands. It is also a market for precious stones, which are found here in great abundance. It is a city where good profits are made by travelling merchants (cited in Bloom and Blair 2001: 164). The Muslims were particularly dependent on trade with many parts of Africa (not just North Africa). This was so for a number of reasons including first, that Egypt presided over one of the vital trade routes that linked the Far East and West (or the Southern Route in which Cairo was the terminus at the head of the Red Sea; and second, African markets constituted probably the most profitable branch of Islam’s foreign trade. Islamic dhows carrying cargo plied the route down the East African coast as far south as Sufālah in Mozambique and Qanbalu (Madagascar). Gold was mined in various places including Ethiopia and Zimbabwe, while Kilwa (present day southern Tanzania) was the principal entrepôt. 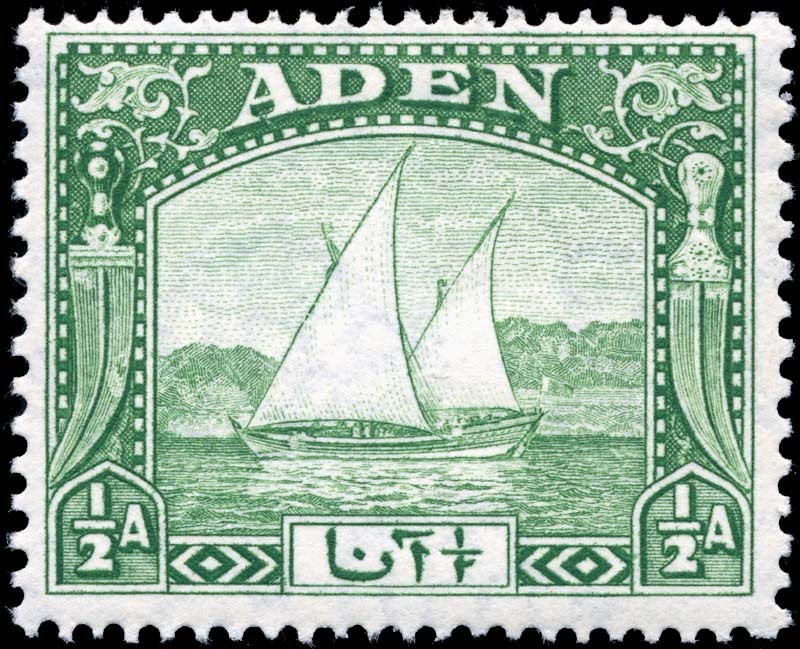 The most intense commercial relations experienced by the East African ports were with Aden, Suhār and Sīrāf. And this long-distance trade also helped stimulate trade into the African hinterland. So it would be wrong to assume that West Africa was commercially isolated from the east coast and was ‘brought to life’ by the Europeans after 1492 (see Wolf 1982: 37–44). For it was the much earlier Islamic arrivalat western entrepôts such as Sijilmassa (in Morocco) and Awdaghast that enabled the inter-linking of the eastern and western coasts both in the northern and sub-Saharan regions (Bovill 1933: chs. 5–6). All in all, even before the turn of the second millennium, on the very eve of the ‘European commercial revolution’ the Muslims in particular had woven together vast swathes of Afro-Asia into an increasingly singular economic unit. And it was into this wider circuit of trade that Europe became, albeit indirectly, inserted into when it turned to commerce after about 1000. Eurocentric world history, as already noted, assumes that the rise of commerce was given its decisive thrust by the Europeans, most especially the Italians, after about 1000 ce. This date, of course, conventionally signifies the end of the Dark Ages. But the period after about 500 and especially after 650 could be called the period of the Eastern ‘Bright Dark Age’, especially the Middle Eastern Dark bright Age (Bala et al 2010). While Afro-Asian trade accelerated after about 1000 this owes its primary thrust to the growing interconnections between the Islamic Middle East and Africa in the west, as well as India, Southeast Asia and especially China in the east. The Middle East in effect constituted the Bridge of the World. And as noted above, it was into this vast system of commerce that the Europeans inserted themselves. Thus before I describe this wider system, it is necessary to begin this discussion by considering how Europe in general and Italy in particular benefited from the growing Eastern trade in general and the role of Islamic West Asia in particular. The East not only lay at the other end of the European long distance trading circuit but it also played a crucial role in the rise of European trade itself. For the fact is that European trade was ultimately made possible only by the flow of Eastern goods which entered Europe, mainly via Italy. Nevertheless, this is not to say that Italy was unimportant to the fortunes of European commerce, finance and production. 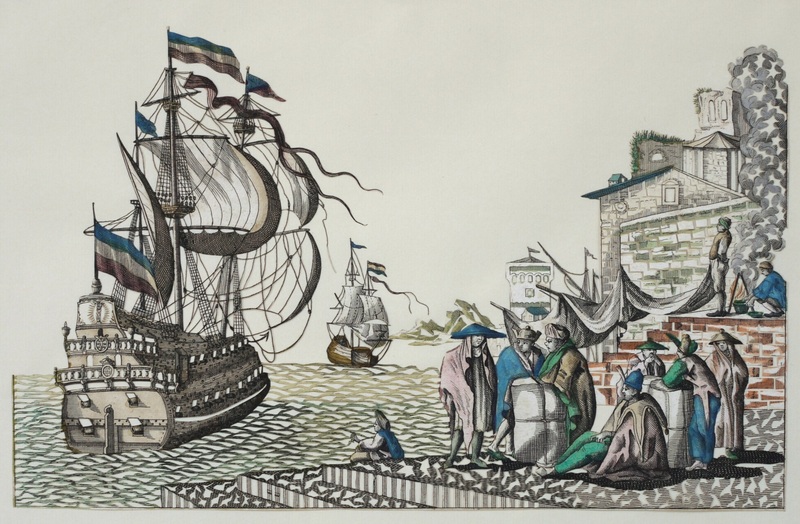 For it was in fact pivotal, constituting the heart of European trade thereby pumping goods all round the ‘continent’ and feeding them into the many intra-regional trading systems (such as the Hanse and the French Champagne Fairs). But it was only able to play this central role because Italy was one of the major conduits through which Eastern ‘resources’ and trade entered and reshaped Europe. Indeed, the vast majority of this trade entered Italy courtesy of the North African Muslims in Egypt, who were supplied by the Southern trade route (based in the Red Sea). 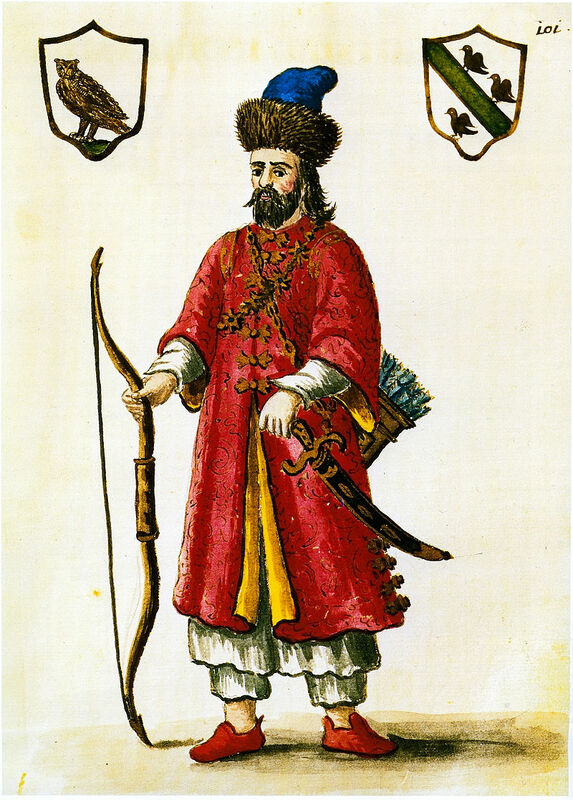 I now want to sketch the role of the Muslims in shaping Afro-Eurasian regionalization in the 1000–1492/1517 era. While the Middle Route became particularly important after the sixth century, it became extremely influential when Baghdad was the prime Muslim centre of trade after 750. But when Baghdad was plundered by the Mongols in 1258, the route underwent a temporary decline. However, with Iraq being subsequently ruled from Persia, the Gulf route revived. This Middle Route was also important because it enabled a ‘deeply symbiotic’ trading relationship between the Crusader kingdoms and the Muslim merchants who brought goods from as far away as the Orient. The chief Crusader port in the Middle East – Acre – was controlled upto 1291 by the Venetians, and there they excluded their Pisan and Genoese rivals. 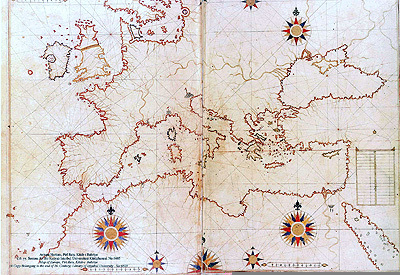 Nevertheless, although the Venetians dominated the Europeantrading system, they always entered the global system on terms dictated by the Middle Eastern Muslims and especially the North African Mulsims. Then with the Fall of Acre in 1291, the Venetians had no choice but to rely on the Southern route which was dominated by the Egyptians. The Southern route linked the Alexandria-Cairo-Red Sea complex with the Arabian Sea and then the Indian Ocean and beyond. After the 13th century Egypt constituted the major gateway to the East. Importantly, ‘[w]hoever controlled the sea-route to Asia could set the terms of trade for a Europe now in retreat. From the thirteenth century and upto the sixteenth that power was Egypt’ (Abu-Lughod 1989: 149). 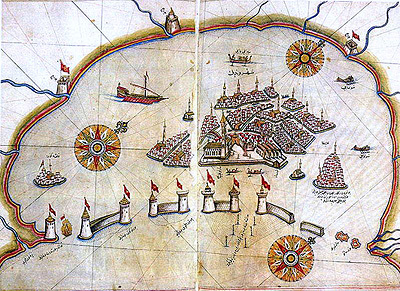 Indeed between 1291–1517 about 80 per cent of all trade that passed to the East by sea was controlled by the Egyptians. But when Baghdad fell, Al-Qahirah – later Europeanised to Cairo – became the capital of the Islamic world and the pivotal centre of global trade (though this latter process had begun under the Fatimids in the tenth century). Eurocentric scholars emphasise that European international trade with the East dried up after 1291 (with the Fall of Acre) as Egypt dominated the Red Sea trade to the East at the expense of the Christian Europeans. And it is this that supposedly prompted the Portuguese Vivaldi brothers to search for the more southerly route to the Indies via the Cape in 1291. 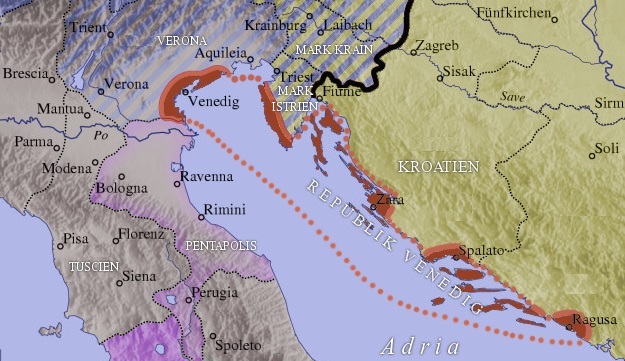 But despite the proclamation of various papal prohibitions on trade with the ‘infidel’, the Venetians managed to circumvent the ban and secured new treaties with the Sultan in 1355 and 1361. And right down to 1517, Venice survived because Egypt played such an important role within the global economy. Moreover, Venice and Genoa were not the ‘pioneers’ of global trade but adaptors, inserting themselves into the interstices of the Afro-Asian-led global economy and entering the global economy very much on terms laid down by the Middle Eastern Muslims and especially the Egyptians. In particular, European merchants were blocked from passing through Egypt. When they arrived in Alexandria they were met by customs officials, who stayed on board and supervised the unloading of the goods. Christians in particular required a special permit or visa and paid a higher tax than did their Muslim counterparts. The Europeans then retired to their own quarters which were governed by their own laws. However, they were not allowed to leave their quarters in Alexandria and became wholly dependent upon the Egyptian merchants and government officials. Nevertheless, the Venetians and other Europeans accepted this regime because it was there whence they gained access to the many goods produced throughout the East. Indeed the fortunes of Venice were only made possible by its access to Eastern trade via North Africa. But in the end the most important function of Italy’s trading links with the Middle East and later Egypt lay in the fact that these commercial routes constituted important avenues along which many of the vital Eastern ‘resource portfolios’ diffused across to fertilise the backward West. And these resource portfolios enabled the various ‘Italian’ commercial, financial, and navigational revolutions for which they have become unjustifiably famous. It is generally assumed that a whole series of financial institutions were pioneered by the Italians. 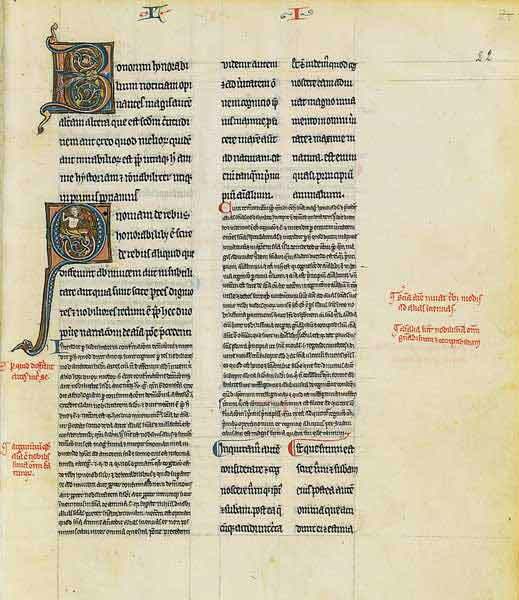 The most important innovation we are told was the commenda (or collegantia), that the Italians allegedly invented around the eleventh century (e.g., North and Thomas 1973: 53). This was a contractual agreement in which an investor financed the trip of a merchant. Not only did it support international trade through the bringing together of capital and ‘trading labour’, but it had similar effects to a stock exchange in that it provided a market for savings which thereby fanned the flames of economic development. The only problem, though, is that the commenda was invented in the Middle East. And although its roots stem back to pre-Islamic times (Kister 1965: 117ff), it was developed furthest by the early Islamic merchants. Indeed as Abraham Udovitch notes, ‘it is the Islamic form of this contract (qirād, muqārada, mudāraba) which is the earliest example of a commercial arrangement identical with that economic and legal institution which [much later] became known in Europe as the commenda’ (or Collegantzia) (Udovitch 1970a: 48). Nevertheless this should hardly be a ‘revelation’ given that The Prophet Mohammed himself had been a commenda merchant. Nor should it be altogether surprising that the Italians came to use this institution given that Italy was linked directly into the Islamic trading system. It is also noteworthy that from the eighth century the qirād was applied in Islam to credit and manufacturing, not just to trade (Udovitch 1970b: 78; Kunitzsch 1967: 362–7). The Italians are also wrongly accredited the discovery of a range of other financial institutions including the bill of exchange, credit institutions, insurance, and banking. Turning therefore to the creation of economic institutions, while Rajat Kanta Ray claims that it is likely ‘that the use of bills of exchange and the art of banking evolved in China before any other civilization’, it is more likely that these originated in Islam and the pre-Islamic Middle East. However, one of the principal reasons laid down by Eurocentrism for the so-called ‘impossibility’ of rational Islamic economic institutions and hence the absence of Islamic trade lies in its emphasis on Islam’s prohibition of usury or lending at interest (though Eurocentrism brushes over the fact that the Catholic Church no less prohibited usury). The restrictions in the area of trade and exchange, as well as in other areas of life, placed certain areas of [mercantile] practice on an inevitable collision course with [Islamic] legal theory. This situation gave rise to a special branch of legal writings, the hiyal(legal devices) literature, in which the lawyers attempted to narrow down the area in which actions would be in violation of the law by making them conform to the law formally while in reality circumventing it. or again, qirād investments were deployed which allowed for a return on the capital advanced that exceeded the original amount that was offered. ‘All these satisfied the same needs as interest-bearing loans by realizing a profitable return for the investor, and providing a flow of capital for the trader’. Critically, Islamic bankers – known as hawaladars and sarāffs – were a common-place feature of Islamic trade. The hawaladars, operating in the bazaars, were a vital conduit for international trade, transferring funds from one place to another. The Islamic bankers issued credit notes – the ‘demand note’ or bill of exchange at a distant location (suftaja) and the ‘order to pay’ (hawāla) which was identical to a modern cheque: ‘[a]t the upper left corner was the amount to be paid (in numbers), and in the lower left corner was the date and then the name of the payer’. Equally, though, it would be wrong to presume that rational mercantile and capitalist activity occurred despitethe role played by Islam or that it happened purely behind the backs of the religious authorities. For Islam became a virtual synonym for trans-continental commerce and profit. Indeed, contra our Eurocentric imagination, Islam could lay fair claim to the pursuit of rational commercial and profit-making activity throughout the period when Europe languished under Catholic rule. In addition, the Italians are usually attributed the discovery of advanced accounting systems. 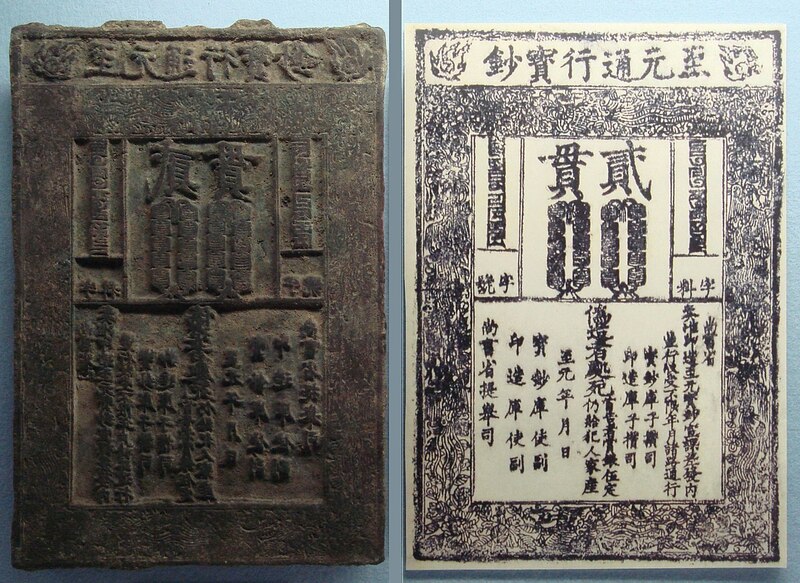 But various Eastern accounting systems were also well developed, especially in the Middle East, India and most notably in China. Indeed some of these were probably as efficient as Weber’s celebrated Occidental ‘double-entry’ method. It is true that the Pisan, Leonardo Fibonacci, living in Tunis, was an important figure within Europe, serving to advance the Italian accounting system. But he only was so because he had learned of the Eastern knowledge while living in Tunis. ‘Capitalist’ is not too anachronistic a word. From one end of Islam’s world connections to the other, speculators unstintingly gambled on trade. One Arab author, Hariri had a merchant declare: ‘I want to send Persian saffron to China, where I hear that it fetches a high price, and then ship Chinese porcelain to Greece, Greek brocade to India, Indian iron to Aleppo, Aleppo glass to the Yemen and Yemeni striped material to Persia’. In Basra, settlements between merchants were made by what we would now call a clearing system. A string of Islamic intensive (productive) innovations and technological/ideational refinements was crucial here. These comprised, inter alia, paper manufacturing, which began after 751, and textile-manufacturing with both Syria and Iraq being famous for their silk manufactures, while Egypt led the way in linen and woollen fabrics. Moreover, Islamic production extended to sugar-refinement, construction, furniture manufacture, glass, leather tanning, pottery and stone cutting and of course Yemeni steel. Interestingly, Egyptian sugar-cane production was a leading global industry and extensively exported its refined ‘sukkar’ across much of the world (hence the term ‘sugar’). Indeed, when the Spanish developed sugar production they borrowed the ideas and technologies of the Muslims, as did the British later in Barbados after the 1640s. Muslims also used impressive dyes. Added to this list of Islamic gifts that were bequeathed to Europe were the Gothic arch and other architectural developments, developments in music, agriculture, and foods such as oranges, lemons, apricots, bananas, courgettes, artichokes and, last but not least, coffee. However, so fraught in methodological terms is this transmission issue that the whole question of the transmission of non-Western resource portfolios in the context of the rise of Western modernity has been marginalised and often ignored or rejected by world economic-historians on the grounds that there is not always in place a paper trail of relics that such disciplinary scholars view as the cardinal criterion of proof of transmission. Where there is no clear evidence of transmission for the modern period under discussion then we find ourselves in the realm of ‘plausible conjecture’. Of what does this comprise? Here I offer up what I call the ‘Bala proof’ theorem of transmission (after Arun Bala’s argument that he made in his book The Dialogue of Civilizations in the Birth of Modern Science): that it is not enough to assert cross-civilizational transfer in those cases where an idea that appeared in Europe was invented previously elsewhere, nor is it enough to offer up only circumstantial evidence (though this can constitute part of what constitutes ‘plausible conjecture’). 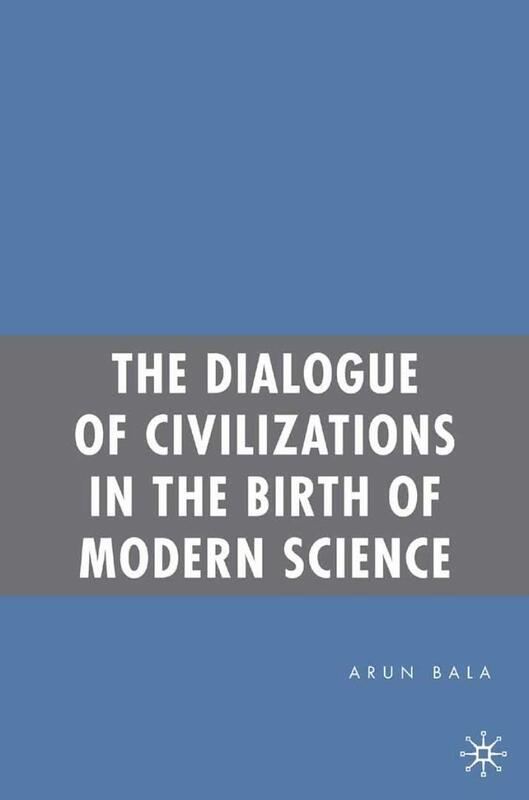 Rather, Arun Bala argues that we can reasonably infer transmission in those situations where a particular culture, in this case Italy, is interested in understanding an earlier invention in various non-Western civilizations, in this case the Islamic Middle East and North Africa, and when the non-Western invention then soon after that interest is displayed becomes adopted (and adapted) within Europe. It is obviously the case that from at least 1000 onwards Italian merchants were engaged in looking for ways to tap into long distance trade that emanated beyond Europe’s boundaries. They would surely have been aware of the advanced institutions that existed in the Middle East as they would have encountered these in their dealings with them. Moreover, the Europeans learned not only about Islamic economic institutions but also their ideas on science, mathematics, philosophy, geography, engineering, astronomy and many others too numerous to list here. 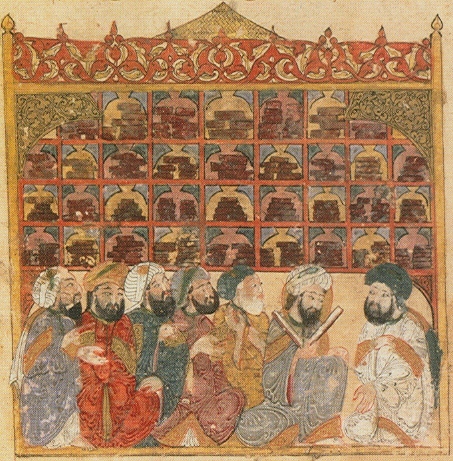 In the early ninth century CE the seventh Abbasid caliph, al-Ma’mūn, founded the ‘House of Wisdom’ (Bayt al-Hikmah) in Baghdad where inter alia Greek works – especially those of Ptolemy, Archimedes and Euclid – were translated into Arabic. But Arab scholars also drew heavily on Persian and Indian (as well as Chinese) texts on medicine, mathematics, philosophy, theology, literature and poetry. They then crafted a new corpus of knowledge – with the help of Jewish scientists and translators – that was not only more than simply an amalgam of Greek thought but one that was often not only critical of Greek ideas but also took them much further, if not in new directions. This process was aided by the fact that Baghdad stood at the centre of the Afro-Eurasian economy and not only received new Asian ideas but, having reworked them, transmitted them across to Islamic Spain. Increasingly after 1000, Europeans translated the Islamic scientific texts into Latin. The fall of Spanish Toledo in 1085 was especially significant, for it was here where many European intellectuals gained access to Islamic technical books. Learning from Islam was continued on by the Spanish King Alfonso X (1252-1284), largely through Jewish intermediaries (as did the Portuguese kings). 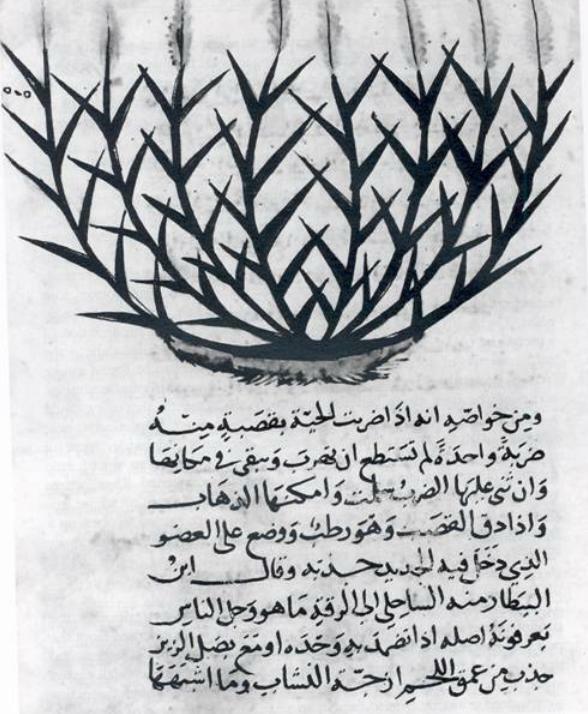 Of the many examples on offer, notable here is that in 1266 Ibn Khalaf al-Murādī’s important text, The Book of Secrets about the Results of Thoughts, was translated at the Toledan Court. This text and many others would have furnished the Iberians with a great deal of Islam’s innovations. Finally, the Italians also directly learned of these ideas both through their trading links with the Middle East and during the Crusades. So to return to the point being made earlier: we can see that after about 1000 the Europeans demonstrated a strong and keen interest in learning from the Islamic Middle East and North Africa: Which means that this ticks the key box concerning the Bala Proof theorem of the transmission of Islamic economic institutions. Rather than go through all of these in detail since space has got the better of me, let me close with the following vignette. Conclusion: What have the Muslims ever done for us? Finally I want to conclude this piece by drawing from the scene in Monty Python’s famous film ‘The Life of Brian’, in which Reg, the ‘inspirational’ leader of the revolutionary party – the PFJ (Peoples’ Front of Judea)… or was it the PPFJ (the Popular Peoples’ Front of Judea)?… oh never mind… convenes a secret meeting to rally his revolutionary comrades to overthrow the ‘oppressive and much reviled’ Roman Empire. Here I shall modify that whole scene by substituting the Muslims for the Romans. In this alternative scene Reg obviously now stands for an anti-Muslim Western organization (though I shall leave it to your imagination as to which one that might be). Please note that Reg’s speech is presented without quotation marks, while the comments made by the audience members are placed in quotation marks. Yeah alright Stan, don’t labour the point… And WHAT have the Muslims ever given us in return? What? Regs demands in a scathing tone. “The noria… you know Reg, the huge water wheels that lift water up into the aqueducts”. “Windmills and water-mills”, another audience member interjects. “Yeah, don’t forget all the new irrigation techniques that the Muslims pioneered. For they’ve been a positive boon here in the heat of al-Andalusian Spain”. Yeah OK, the Muslims did bring all of this to Europe when we were busy messing around with the abacus. Gee, I never did like the abacus. “Yeah, yeah yeah” (they all say in rousing unison). and… last but not least… the creation of an Afro-Eurasian economy after 650 ce that linked Europe into the mainstream of Afro-Asian trade and later the Eastern creation of the first global economy after 1492 that delivered not only a vibrant stream of Eastern trade but more importantly the many Asian inventions, institutions, ideas, technologies, production techniques and a list of foods and agricultural and manufacturing products far too numerous to list here… apart from all of this, WHAT have the Muslims ever done for us? Please note that rather than supply a bibliography I refer my reader to three of my writings which provide all of these: The Eastern Origins of Western Civilisation (Cambridge: Cambridge University Press, 2004); ‘Islamic Commerce and Finance in the Rise of the West’, in Nayef R.F. Al-Rodhan (ed. ), The Role of the Arab-Islamic World in the Rise of the West (Houndmills: Palgrave, 2012), 84–115; ‘What have the Muslims ever done for us?’, in Rajani K. Kanth (ed.) The Challenge of Eurocentrism (Houndmills: Palgrave Macmillan, 2009): 217–35. Hourani (1963: 62); Abu-Lughod (1989: 199): Chittick (1970: 98). Though this is not to ignore the considerable production of manufactured goods that occurred in the Islamic world. Goitein (1967: 197–9) Udovitch (1970a: 80, 1970b: 61-2). 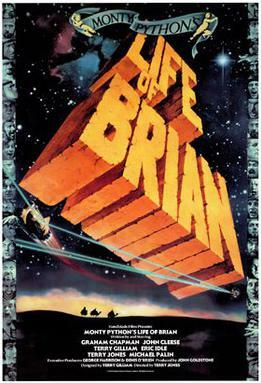 See especially: Rodinson (1978); Hodgson (1974, 1993). Cf. Rodinson (1974: 14, 16–17, 29).